In this post, we compare the August Smart Lock Pro vs Kwikset Kevo. The main points of comparison are Features, Functionality, Integration, and Price. The quiet evolution of the household, from an inanimate structure offering basic protection for you and your personal items to a fully automated unit that allows you to control almost every aspect of your house from your smartphone, has branched over to security measures in recent years. If you’re a concerned homeowner who is looking to feel more safe and secure when it comes to your house or apartment, you may want to consider upgrading to a Smart Lock. Today I’ll be comparing the two leading Smart Locks on the market today: The August Smart Lock Pro and the Kwikset Kevo. August Smart Lock Pro and Kwikset Kevo are examples of smart locks that have replaced the deadbolts allowing you to have keyless entries and exits to and from your house respectively. The integrations present in the August Smart Lock Pro include app support, auto-unlock, auto-lock, remote access, August connect, and DoorSense. The smart lock also works with a number of other software namely Apple Homekit, Amazon Alexa, Google Assistant and Z-Wave Plus. August Smart Lock Pro allows the user to control it from any location. When nearby, one can easily lock and unlock doors through Bluetooth, Z-Wave or Google Assistant. It also allows a user to give access to other parties without necessarily being there. Installing an August Smart Lock Pro does not require help and it takes the shortest time possible. However, the lock has its disadvantages. For instance, it is not compatible with all deadbolts so finding the compatible one can be tricky. Also, the Homekit may be problematic while setting up despite the smooth installation. The smart lock may also not benefit non-Apple users because their phones do not support Siri. Regardless of this fact, the lock caters for the needs of all its users whether they have iPhones or not. Kwikset Kevo is a Bluetooth deadbolt is an easy to install deadbolt because it does not necessarily require professional help. One just needs to follow the instructions on the manual. To operate this lock, one should download the Kevo on their phone. The Kwikset Kevo takes the form of both traditional and modern smart locks because of its partially standard, partially electronic model. When using a Kwikset Kevo deadbolt, one just needs to tap the lock’s casing to unlock the door, provided their phone is nearby. The same goes for locking the door. According to iMore, this is all made possible using a “patent-pending” method that allows Kevo to differentiate when a phone is inside the house or outside. Unless the owner of the house allows someone else into the house, then there is no way they can get access. However, Kwikset Kevo can only work within the Bluetooth range. Kwikset Kevo is definitely an upgrade of the traditional deadbolts and its electronic capabilities match those of other smart locks. When comparing the August Smart Lock Pro and Kwikset Kevo, it is important to consider the design, features, usability and performance of each lock. With regards to the design, the August Smart Lock Pro is much more convenient. This is because it is easier to install than its counterpart. Also, the design of this lock is both modern and traditional due to its standard and electronic aspects. Installing the August Smart Lock Pro takes up minutes as opposed to installing the Kwikset Kevo. The August Smart Lock Pro is fully modern and takes up less space on the door. On the other hand, the minimum amount of time spent on the installation of a Kwikset Kevo is an hour and a half. The features of the August Smart Lock Pro are more efficient than those of Kwikset Kevo. This is because the former smart lock comprises of more integrations than the latter. Despite this difference in features, both smart locks can be remotely accessed and offer more or less the same functions. The August Smart Lock Pro makes use of a variety of virtual assistants namely Google Assistant and Amazon Alexa among others. On the contrary, Kwikset Kevo facilitates Amazon Alexa which is made possible by the presence of Kevo Plus, Kwikset Kevo’s Wi-Fi accessory. The usability of both smart locks may also vary at some point. For instance, while each smart lock can allow access remotely, the August Smart Lock Pro is more effective. 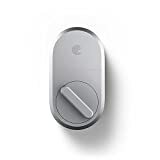 While the Kwikset Kevo requires a Bluetooth connection, the August Smart Lock Pro has a variety of other programs that can lock and unlock doors from far distances where a Bluetooth connection cannot assist. In reference to performance, each smart lock achieves effectiveness differently. For instance, the Kwikset Kevo smart lock requires a homeowner to tap the lock even with the phone in the pocket. On the other hand, the August Smart Lock Pro requires the use of the August app to lock and unlock the door. The August Smart Lock Pro is more expensive than the Kwikset Kevo. August Smart Lock Pro is safer and more efficient than the Kwikset Kevo. The August Smart Lock Pro has more inbuilt software than its competitor which improves its effectiveness. Each of the two has been developed in terms of generations, that is, two generations for the Kwikset Kevo model and three generations for the August Smart Lock Pro. Now let us look at the in-depth comparison between August Smart Lock Pro and Kwikset Kevo. The main points of comparison are Features, Functionality, Integration, and Price. The August Smart Lock Pro comes as one circular sensor that is installed on the inside of your door, which doesn’t necessitate changing your exterior hardware (you can also order it with a Connect unit for added features which I will also cover). It can be attached to your existing deadbolt, with an estimated installation time of 10 minutes. The installation process itself is simple and only requires a standard Phillips screwdriver. The Smart Lock Pro requires 4 AA batteries in order to operate, which come included. So how does it work? Once installed, the Smart Pro Lock will lock the door automatically each time you leave. Whenever your return to your home, the Smart Lock Pro will unlock the door via Bluetooth, Z-Wave technology or voice control. You can also use the free August app and/or Siri (seeing as the lock is Apple Homekit ready). If you order the August Connect Wi-Fi Bridge alongside the base unit, you will unlock extra features and functionalities. The Connect unit (which plugs into a standard outlet) will enable you to check on the status of your door through the accompanying August app. You can also use the app to keep track of incoming and outgoing traffic and give keyless access to friends, guests, and housekeepers if you’re not around to let them in. Moreover, the Connect unit is compatible with Alexa and Google Assistant and allows you to give control over your lock. As far as integration goes, the Smart Lock Pro is compatible with the August Smart Keypad and the August Doorbell Cam Pro. The August Connect Wi-Fi Bridge integrates with other smart home services and products such as HomeAway, Airbnb, and Nest. You can choose between two color schemes (Black and Silver). August offers free standard shipping on all U.S orders and has a 30-day satisfaction guarantee policy that allows you to return the product within the said time frame to get your money back. Unlike the August Smart Lock Pro, the Kwikset Kevo is a family of different products, so I will be giving a general overview of their features. Installation can vary on which Kevo product you are considering. The Kevo Convert will, much like the August Smart Lock Pro, convert your existing lock into a smart lock, so it will only require an interior installation. The Kevo Smart Lock (both the Traditional and the Contemporary versions), however, requires both interior and exterior installation, but similarly to the Smart Lock Pro only requires a screwdriver. Much like the Smart Lock Pro, you can open your door by using your smartphone and keys. Kevo does offer an additional product that gives you the ability to open your door with a fob instead of your smartphone. Both products offer an additional service that adds Wi-Fi capabilities to your smart lock. Kwikset’s service is called Kevo Plus. In similar fashion to August’s Connect Wi-Fi bridge, Kevo Plus allows you to control your lock remotely, track traffic, and give remote access to family and friends with an accompanying app. A service unique to Kevo Plus lets you authorize a neighbor to access your home in case of emergency. On the integration front, Kevo has the upper hand. Depending on whether or not you have Kevo Plus, you can make your smart lock with a variety of products like Alexa, Ring and Skybell Video Doorbells, Nest and Honeywell Thermostats, Android Wear and more. Seeing as most of the Kevo products are not sold directly through Kwikset (with the exception of Kevo Plus), but rather through popular retailers such as Amazon, Lowe’s and Best Buy, prices and shipping costs may vary. Kevo offers more in the way of color customization, with Venetian bronze, nickel and brass color schemes among others. Hope this article helped you clarify the differences between the August Smart Lock Pro vs Kwikset Kevo. You can now make your decision on the basis of all the factors discussed above. When you are ready to make the leap in home security, I hope this article will help you make an educated decision. Can a Smart Lock be Picked?